Thank you, American Dairy Association Mideast, for sponsoring this post! All opinions are 100% my own. 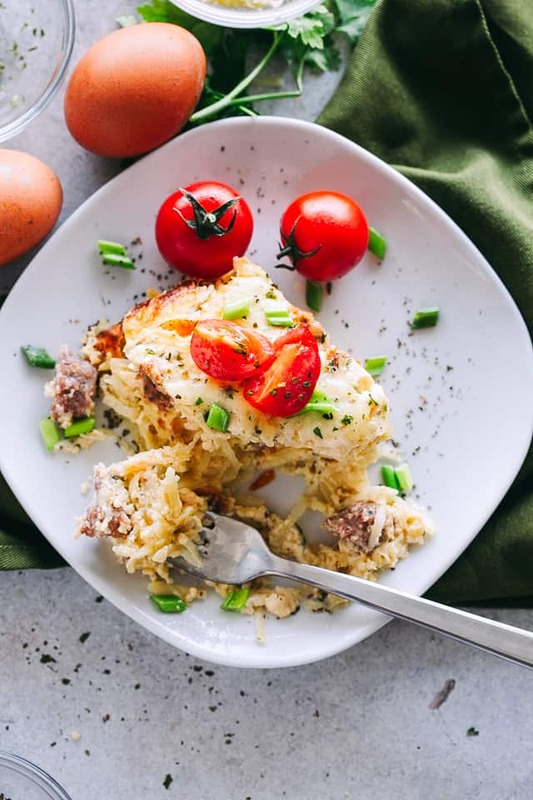 Overnight Slow Cooker Breakfast Casserole – Set this easy crock pot recipe overnight and wake up to an amazing breakfast casserole loaded with hash browns, cheese, sausage, and eggs. Perfect for Christmas or Holiday mornings, and when hosting a big crowd. If it weren’t for milk, cheese, eggs, and sausage, I could go vegan! High-fives, my people! Happy Happy Day! Hope you’re Cyber Monday was a good one, and you are now ready for Christmas-planning. As in, food menu plans and such. 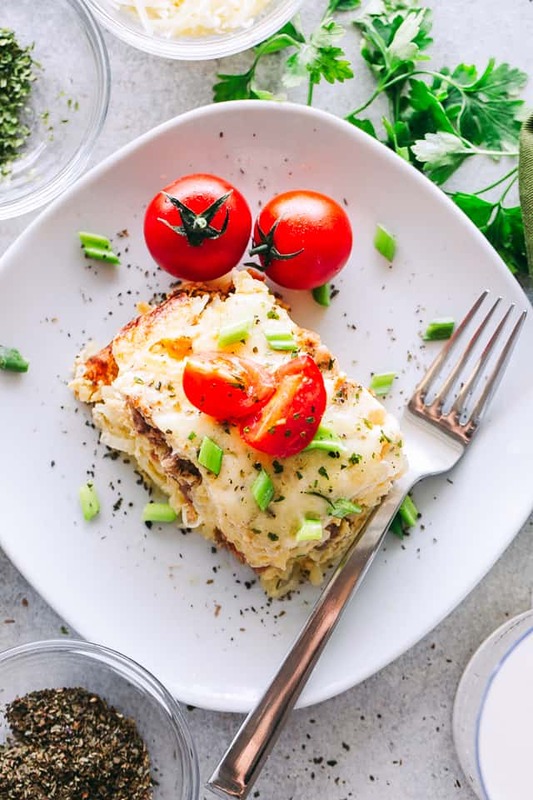 I love breakfast casseroles, I love a good brunch, and I love my family and friends. And I really LOVE a reunion with family and friends around the table when we get to part take in such brunches during the Holidays. Nutritionists recommend 3 servings of milk a day, which is about a gallon each week, but 46 million Americans – including 12 million children – served by Feeding America only get on average 1 gallon of milk ALL year. Kids need milk’s nine essential nutrients to grow up healthy. Also, milk is the No. 1 nutritious product requested by food bank clients, but it is rarely donated. The Great American Milk Drive is delivering thousands of gallons of milk to families who would otherwise go without. Donate milk this holiday season, and how much milk has been donated in your state at www.MilkLife.com/give. A $5 donation gives a gallon of milk to a family in-need. Cooking with milk is an easy way to add calcium and add all those other essential nutrients to holiday dishes. 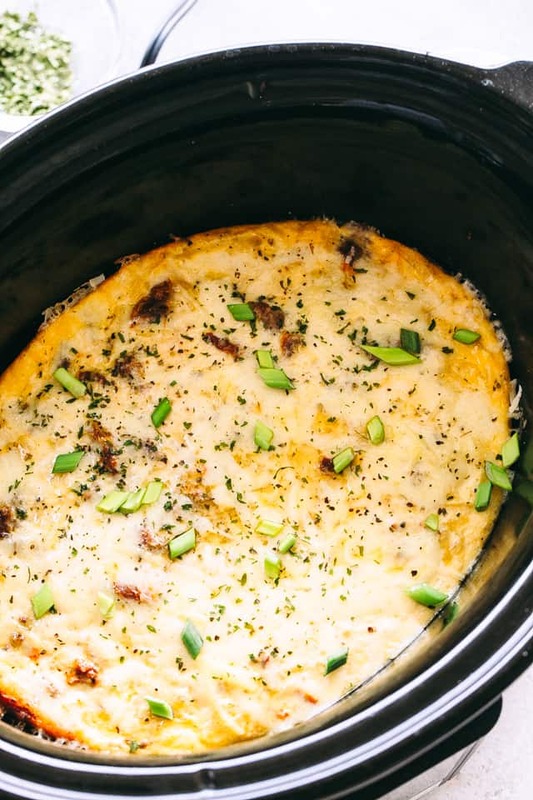 In this Overnight Slow Cooker Breakfast Casserole, I included 1/2 cup of milk, 1/2 cup half and half, some cheese, and more cheeses. Those cows will be SO proud of me! But, you guys, this breakfast recipe really is one of the BEST! You put all the ingredients in before you go to bed, set your slow cooker on low, and wake up to FOOD! And what really makes it all come together is topping it off with a generous sprinkle of more cheese, green onions, and tomatoes. The simplicity of putting this together will probably make you want to run to your slow cooker at this very moment and get it going. 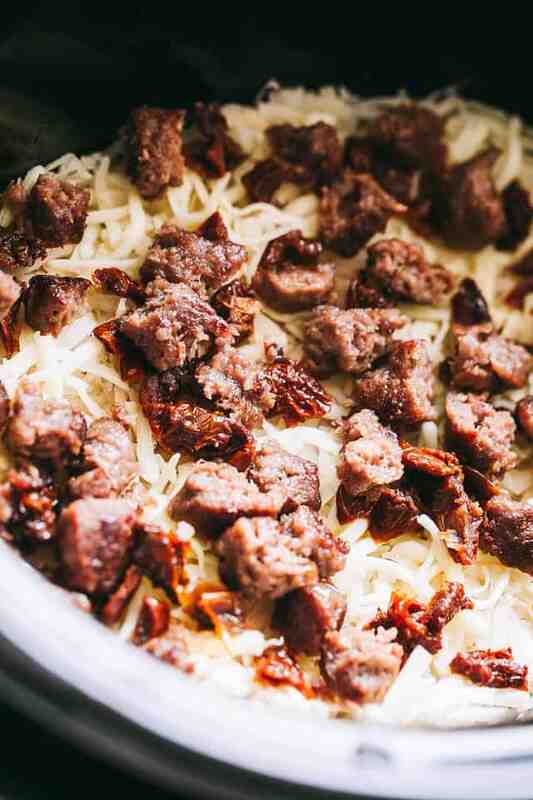 All you have to do is layer hashbrowns on the bottom of your slow cooker, sprinkle some sundried tomatoes over them, and follow up with diced up sausage links or brown up some beef, if you want the extra work. THEN, you’ll whip up some eggs and milk, pour that over the taters and cheese, cover, and let it do its thing while you sleep. Come Christmas morning, all you will have to do is set up some plates and forks, and get everyone to the breakfast table because it’s time to grub! For more information about dairy nutrition, to find delicious new recipes, and to meet Ohio and West Virginia dairy farmers, visit www.Drink-MIlk.com, and follow the American Dairy Association Mideast on Facebook, Twitter, Pinterest and Instagram. 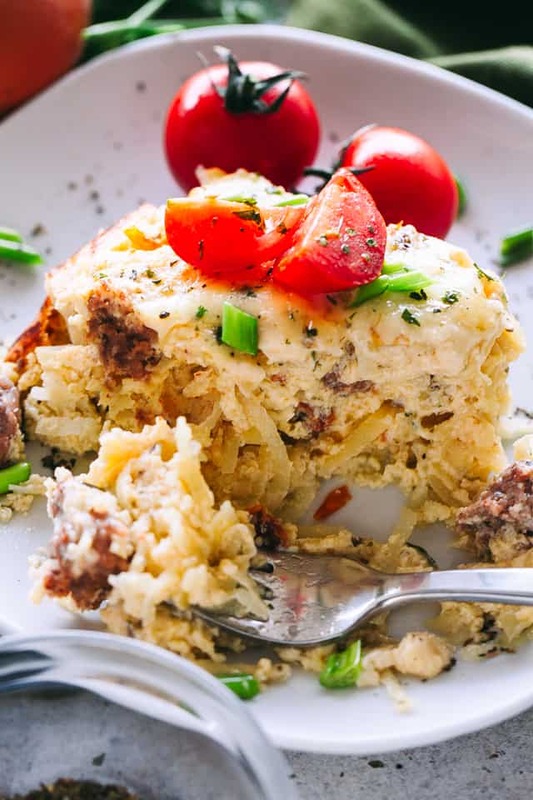 Set the slow cooker overnight and wake up to this amazing breakfast casserole loaded with hashbrowns, cheese, sausage, and eggs. Perfect for Christmas or Holiday mornings, and when hosting a big crowd. 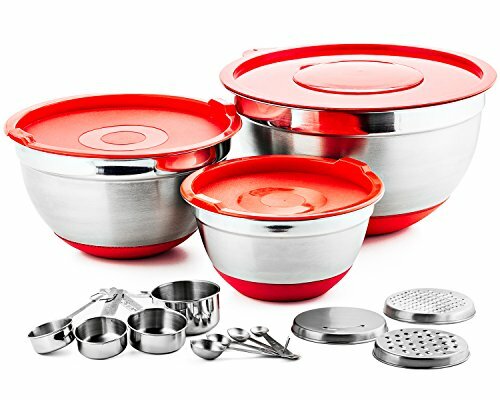 Spray slow cooker with a nonstick cooking spray. 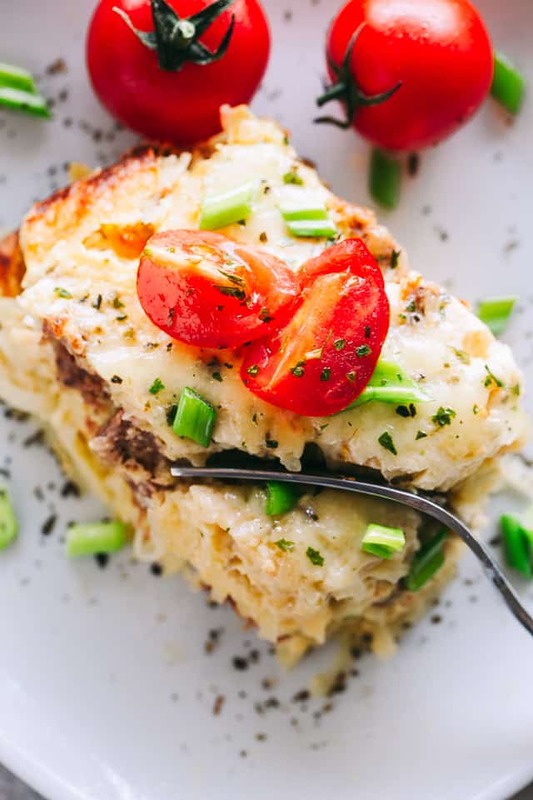 Layer shredded potatoes or hash browns on the bottom of the slow cooker. Sprinkle top of potatoes with half of shredded mozzarella cheese, parmigiano reggiano cheese, sausage links, and chopped sun-dried tomatoes. Set aside. In a mixing bowl combine eggs, half & half, and milk; whisk until well combined. Whisk in dried basil, garlic powder, chili powder, salt and black pepper; whisk until completely combined. Pour egg mixture over prepared hash browns and smooth out the top. Sprinkle the rest of the mozzarella cheese over the top. Cover slow cooker and cook on LOW for 6 to 8 hours, OR on HIGH for 3 to 4 hours. Garnish with green onions and tomatoes; Serve. CAN YOU MAKE THIS WITH UNCOOKED SAUSAGE ? WILL IT COOK IN THE SLOW COOKER ? I love slow cooker meals! It is so cool to wke up with such a great breakfast! I am wondering why I never thought to use my slow cooker for breakfast! Soooo smart! 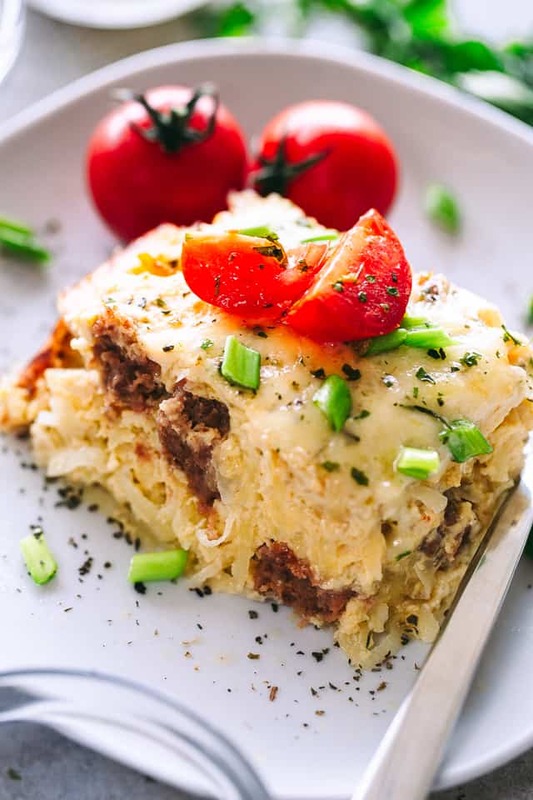 I love breakfast casseroles – and I love the idea of making one in the slow cooker even more! This is perfect for company over the holidays! 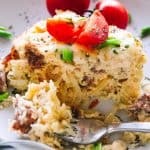 I love overnight breakfast casseroles, but never thought to make it in the slow cooker! I want to eat this for breakfast! This is perfect for when family is in town for the holidays! Bonus that it will be done as we all wake up and everyone gets to hang out and enjoy! Love the idea of making breakfast over night! Will have to make this! I made this last night and it turned out great! Thanks for the recipe! Sadly I a man unable to print any recipes from your site? Please fix your links so IOS users can enjoy as well! Hi! I’m so sorry!! We have been working on it for the past 2 days – it involves updates and upgrades on a bunch of things before everything starts to work how it should… 🙁 Again, very sorry!